Bought the 2" loop because the one that came on my holster was 2.25" and too big. CopsPlus was very helpful in finding out the correct size for my smaller width duty belt. The order was shipped to me very fast and is a perfect fit for the holster I had. I wanted to be able to use this holster as a plain clothes high ride holster but also by using this adapter it is excellent as a duty belt holster. 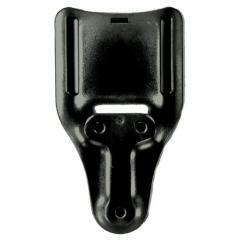 The belt loop is designed for Safariland holsters ONLY.